More like big bass report. Because that is what is happening on Lake Toho right now. The big girls are filling up with eggs and are out eating as much as they can before they move up to spawn. And we’ve been catching them on our guide trips. In record numbers too! Well I don’t exactly know if it’s an official record or not because we haven’t really kept track in years past. But we have more pictures of big fish from this year than from years past. So… I’m calling it a record! 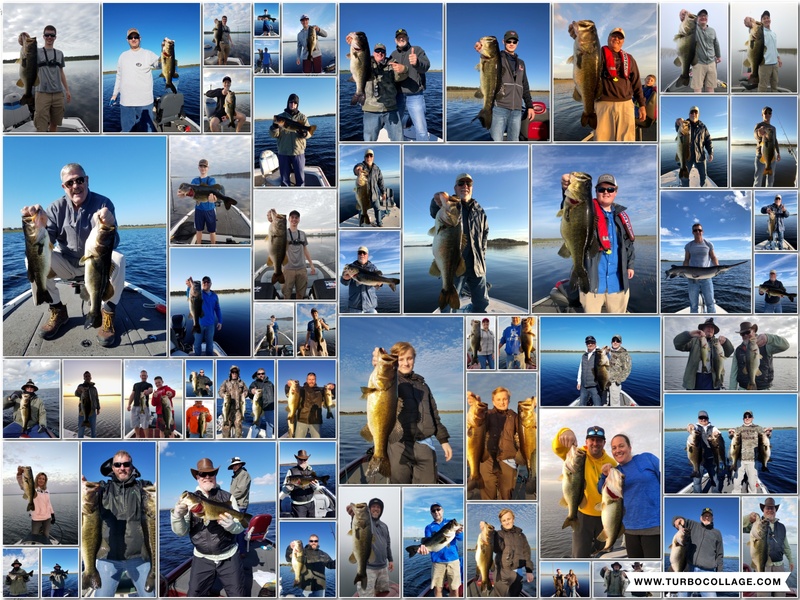 The collage shows just some of the fish that we’ve caught this month on our Lake Toho bass guide trips. We have been catching these fish more consistently than in years past also. The major cold fronts haven’t been hurting the fishing as much as they usually do. Now why is this happening? Well I believe that it is because of something that I originally thought was going to hurt the fishing this year. And that is the large amounts of hydrilla that the FWC has left alive in the lake. You see usually the FWC begins spraying the lake in October and killing off portions of the hydrilla in areas that are over run and areas that the bass use to spawn. This year they started spraying in October and then stopped. Only killing a small amount of the hydrilla. And because there is so much hydrilla left in the lake, these bass are hiding in this thick stuff after cold fronts and are still feeding. Which is why we are still having good day’s after these fronts. Also the bass seem to be spawning just fine with all the hydrilla they are making holes in and around the hydrilla to spawn in. So as you can tell. The pattern has been a hydrilla one. Finding good healthy and green hydrilla is the key to finding these fish. Because we have fish in all three stages right now, pre-spawn, spawning, and post-spawn, these fish are in all levels of the lake. We’ve been able to find good groups of fish out deep, on the out side edges of the grass waiting to go up shallow, and up shallow spawning. Finding what group is biting best just depends on the day. But we’ve found that the deeper bite has been the most consistent. Once you find a group of fish a weighted worm, spinnerbait, swimjig, jerkbait, or speedworm all have been working good for catching them. Look at the area and try to determine which would be best to use. Day’s book up fast at this time of year so it’s important to get your day locked down as soon as possible.